His Eminence, the Most Reverend Herman (Aav) of Finland was an Estonian Orthodox priest who was installed as the ruling hierarch of the Church of Finland as Archbishop of Karelia and All Finland. He served from 1925 to 1960. Herman was born Herman Aav on September 2, 1878 on the island of Hellamaa in Estonia into the family of an Estonian Orthodox parish clerk and schoolteacher and his seamstress wife. He was the oldest of two sons and a daughter who died at a young age. He began his primary education in the Hellamaa Orthodox parish and town schools, while also receiving practice in the Russian language from a local ethnic Russian deacon. During this period he took an interest in painting and music. In 1889, he attended the theological school in Riga, finishing in 1894. He continued his education at the Riga Theological Seminary from 1894 to 1900. After completing his seminary education he began working as a parish clerk and teacher with the Haapsalu Orthodox congregation. During this time, his interests in painting increased, and he considered changing his career and studying at the St. Petersburg Academy of Arts. On September 21, 1904, Herman was ordained a priest by Archbishop Miitavi (Agafangel). His first assignment was as priest of the Orthodox Church in Lelle, Estonia. He continued serving as a priest at different parishes in Estonia until 1923. He was the delegate representing the Orthodox congregations of Estonia and Livonia at the local Russian Council of 1917 in Moscow, serving until 1919. After the conclusion of World War I, Fr. Herman supplemented his income working for the newspaper "Echo Island". In the aftermath of the Bolshevik revolution in Russia, the issue of a successor to the Finnish cathedra arose in newly independent Finland. The candidate presented for Archbishop of Finland by the Russian Church, Abp. Seraphim, did not satisfy the Finns. After unsuccessfully looking for a qualified candidate, the Finns approached the Estonian Apostolic Orthodox Church. Fr. Herman was presented as a candidate. Objections to his lack of Finnish language skills were satisfied as the similarity of Finnish and Estonian languages enabled Fr. Herman to quickly learn the Finnish language. At a synod in June 1922, Fr. Herman was elected as the nominee for the Finnish cathedra but confirmation to the appointment was refused, while Abp. Seraphim was nominated by a separate panel of hierarchs. Further action on the two selections by Patr. Tikhon was prevented by his arrest in Russia. During a visit by Fr. Herman to Finland in the autumn of 1922 to the Finnish Minister of Education, he was found to be appropriate for the episcopal office. In preparation for his taking the episcopal office, Fr. Herman was nominated by the Estonian Apostolic Orthodox Church and accepted by the Finns who placed him on an accelerated change of citizenship. On June 13, 1925, he was elected formally as archbishop. In December 1922, the Finnish government and the Finish Orthodox Church approached the Patriarchate of Constantinople concerning autocephaly and consecration of Fr. Herman as its head. After being informed that recognition would be as autonomy, Fr. 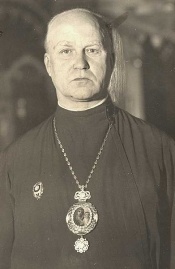 Herman's installation was confirmed on February 8, 1926 as Archbishop of Karelia and All Finland. In 1955, Fr. Paul (Olmari) was elected as an assistant bishop to help the aging Abp. Herman. In August 1960, Abp. Herman retired and was succeeded by Bp. Paul. On January 14, 1961, Abp. Herman reposed at his home in Kuopio. He was buried in the Orthodox Cathedral in Kuopio on January 17. This page was last edited on July 6, 2013, at 09:28.